For the third year in a row, I am honored to be recognized by SuperLawyers magazine as a Rising Star. 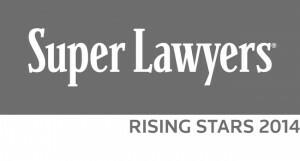 No less than 2.5% of lawyers in the state of Louisiana are named to SuperLawyers’ Rising Stars class, and I’m thrilled to be recognized with many of my peers and colleagues for 2014. With a focus in mesothelioma/asbestos, mass tort, class action and complex litigation, I strive to continually serve my clients to the best of my ability in these areas, and I am grateful to be recognized by SuperLawyers for these accomplishments. In my nine years of practice, I have been involved in several high-profile and complex local and national matters as co-counsel with some of the best attorneys in the country. Although it seems like the residents of the Gulf Coast region seem to consistently face different forms of adversity, I have faith in the legal system and my ability to defend everyday citizens’ rights in the courtroom. I’m looking to the next decade of my practice with great anticipation, seeing it as an opportunity to fight legal battles that make a significant difference in the lives of the Berniard Law Firm’s clients. It’s my hope to continue providing the best legal counsel to the best people in the country by giving back to such a great community.